Tulane’s online social work programs employ cutting-edge learning management system (LMS) technology that effectively supports pedagogy and fieldwork experiences so that our online students receive the full benefits of an education from Tulane. The university’s top-notch faculty, thriving student community (both online and off), organizational partnerships and career services are all brought to bear on the online student’s experience. Students can expect personalized attention at every step of the way as they pursue their coursework and fieldwork experiences within Tulane’s online social work programs. We offer tech support and virtual open-office hours so that students are sure to get the support they need from faculty. 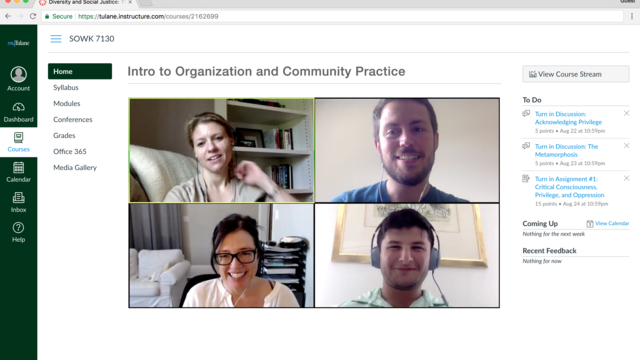 So that students in our online programs can develop lasting working and personal relationships with fellow students and faculty, our courses emphasize group work, collaboration and intimacy within our online classrooms.